When quality and reputation are on the line, trust Setra to ensure safety. 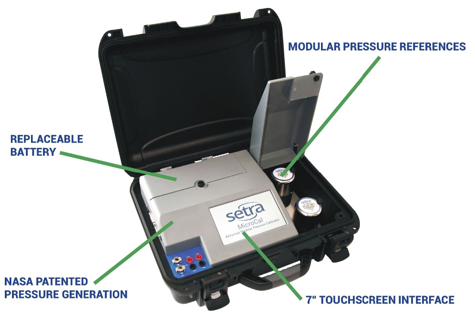 Choose the Pressure Calibrator from the company that knows pressure, Setra Systems. The MicroCal automated pressure calibrator is used as a stand-alone calibration standard for differential and gauge pressure sensors found in critical environments. Setra partnered with NASA to develop the industry's quickest and most stable pressure control for low pressure range applications. The MicroCal combines precise pressure control with high accuracy modular pressure reference providing the quickest and most accurate calibration solution on the market today. The MicroCal is an easy-to-use solution that significantly improves labor productivity and efficiency when compared to the leading competitors, providing immediate ROI. Modular Design to Cover Many Applications - The MicroCal utilizes modular pressure reference, enabling the user to select the most accurate reference for calibrating the unit under test. Competitive calibrators often use fixed higher range reference sensors that do not allow for proper calibration ratios at the low end of the pressure range. 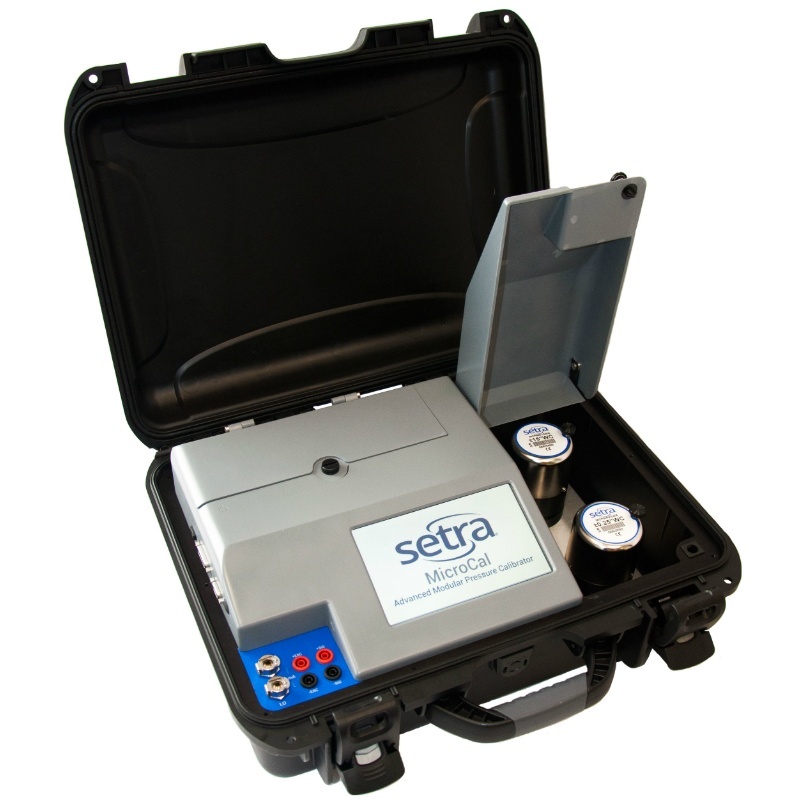 The modular rechargeable battery offers further flexibility to extent available calibration time beyond the standard 8 hours. NASA Patented Technology - The MicroCal is designed to perform calibration checks on installed sensors, pressure switches and gauges that monitor critical applications. The on-board pressure generation system allows for stable & accurate pressure to be applied to the unit under test during calibration, while providing isolation from process background disturbances. The NASA patented technology achieves 0.0002" W.C/step resolution; when combined with the high accuracy the MCPM pressure module, the MicroCal is the ultimate low-pressure calibration device. Reduce Calibration Time - When the fast and stable pressure control is combined with high accuracy reference modules and easy to use interface, the MicroCal can reduce overall calibration time up to 80%. This time savings provides almost immediate ROI based on the number of calibrations performed annually. 7" Touchscreen with Intuitive User Interface - The easy-to-use 7" touchscreen interface, combined with an intuitive menu structure, provides the user with all the features needed for verification and calibration of differential pressure instrumentation. The MicroCal offers the Expert System feature, which detects and automatically calibrates Setra's Model 269 digital pressure transducer. When you need the quickest, most accurate calibration for low pressure applications, choose the MicroCal. At Setra, the performance of our product is second to none, which is why we have no reason to exaggerate our product capabilities. By reading through various competitors' technical specifications, it isn't always clear which product performs the best in specific applications, which is why we tested our product against two leading competitors. 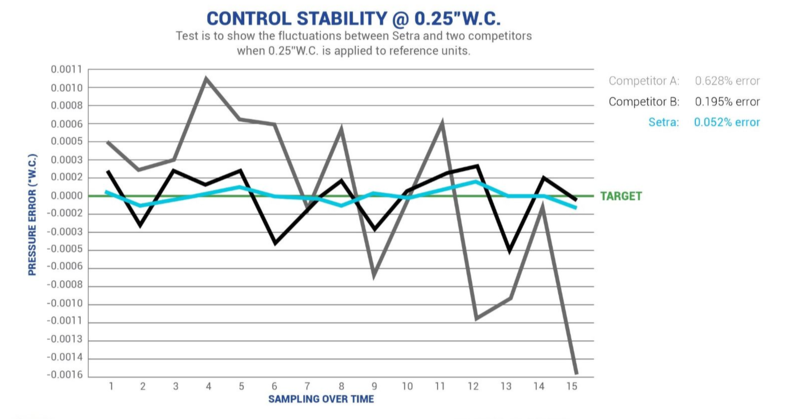 Enabling industry leading control stability - below 0.0002"W.C.
Setra's pressure calibrators have set the bar for the last decade in terms of pressure control and accuracy for low differential pressure in critical applications. 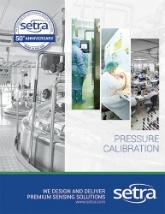 Over 200,000 sensors in pharmaceutical and healthcare facilities are calibrated annually utilizing Setra's calibration technology. Download the Pressure Calibration brochure to learn more about the MicroCal and how it can increase safety while saving you time and money.